Enjoy a smooth, full-bodied tea with slightly smoky notes with this Steep by Bigelow organic oolong and jasmine green tea! Fusing the finest hand-picked teas, this tea blend features a combination of traditional Chinese oolong tea and floral jasmine green tea. The delicate blend features less caffeine than black teas and includes antioxidants that are a great part of any healthy lifestyle. Steep by Bigelow organic teas, such as this oolong and jasmine green tea, are grown using only natural fertilizers that are free of synthetic pesticides and additives. Very light flavor, yes still a big hit with our guests. Very light, we make it iced and hot, tastes better hot in our opinion. This Steep Organic Oolong and Jasmine Green tea is so delicious! Definitely recommend it if anyone wants a flavorful and delicious cup of tea in the morning or at night! Not only to Steep teas by Bigelow taste great the packaging is very marketable. I put all my Steep teas out on display and they SELL! Great product! This is one of the best herbal and caffeinated tea combo I have ever seen. Mostly green tea and jasmine tea customers have commen taste and this tea amazing for them. What a smooth and rich tea. This tea has caught me by surprise and my customers love it! Its a little bit of the East in my little mid-western coffee house. These boxes look a lot more elegant than your standard tea boxes which is one of the reasons we purchased them. Excellent price for a fancier looking item. Great quality tea bags! Taste great, smell great. I bought these because they sell them cheaper here. Great buy, I will try other flavored tea bags next time. Yet another great tea! This was a life savor for me as it truly helped my throat during this rough flu/cough season. Stocked up on this as it's what really helps soothe my throat. I find that Oolong tea helps curb my appetite between meals and minimizes my cravings for sweets. This tea is perfect as is – so skip the sweeteners to reap its full benefits. The tea is a pretty good darkish tea. It has a decent flavor, is organic, and the price is reasonable for the quality. i tend to prefer lighter teas, and indeed, this isn't a personal favorite, but it is a good product for those who do prefer Oolong type teas. I really enjoyed this Oolong and Jasmine Green Tea by Steep. This tea has a strong green tea taste with nice subtle hints of jasmine. The Steep oolong and jasmine green tea is so elegant and oriental. I love the rich jasmine accent to the tea and great while eating Chinese. I love it so much. This tea has a lovely taste, and looks beautiful on the shelves. The packaging makes it an easy sell, and the price is fantastic for re-sale. I don't prefer the Steep brands of tea, I like the Bromley brand teas better. I can't comment on its flavor as I am allergic to green tea. Steep By Bigelow Organic Oolong and Jasmine Green Tea is a great tasting tea that has many medicinal benefits. It has a pleasant aroma and it steeps well. The jasmine isn't as strong as I would like it to taste although that might just be user preference. It was a little bland tasting for resale in my opinion. We appreciate your review, Sara! We are sorry this tea did not meet your expectations. If you are looking for a different recommended product, please contact our Customer Solutions team. This steep oolong and jasmine green tea combines our favorite teas. The combination is perfect that you can taste the oolong goodness and healthy green tea taste. We like this one a lot. A high quality oolong tea that taste great. The addition of jasmine is a plus because it is very soothing and compliments the tea very nicely. You need to try the tea and your guests are sure to love it. I've been looking for good quality oolong tea bags and I love jasmine as well. The flavor combination is awesome! Great price! Will be ordering more. This organic tea was especially well received by our employees. This tea's unique blend of oolong, jasmine combined with the green tea are a happy flavor combination. We will surely reorder this tea! This is one of my favorite teas. Bigelow makes a decent tea, but this Steep line has bolder flavor and a wonderful aroma. This is pretty much the only tea I buy now. 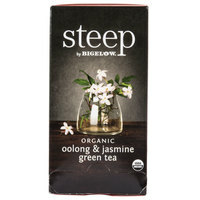 The steep series by Bigelow is definitely a step up from some of the cheaper varieties of tea available here. I usually don't like jasmine flavored tea, but this one is subtle and delicious. Green tea is one of my favorite teas to drink, and jasmine green tea always calms me down at night. This one from Bigelow tastes great. Oolong, jasmine and green tea all in one bag! Steep organic by Bigelow. Taste the difference. Would the extra cost. Customers would love them! 5 stars!! Great combination of oolong and jasmine green tea. Full and refreshing flavor will give you energy when you need it. I love this one like and iced tea! If your a fan of Jasmine this is the tea for you! Its a very good product for the price. It's a very flavorful tea with a nice aroma. Sir Clean recommend this product Steep By Bigelow Organic Oolong and Jasmine Green Tea - 20/Box, the mix of jasmine and green tea is really good. Jasmine tea is among my favorite tea. When I learned Webstaurant was carrying Steep, I immediately ordered all available flavors. I love the brand and would recommend it to everyone! Another green tea in a jasmine with nice notes to it. Love the packaging as it catches the eye because of its darker box with colorful graphics. The Bigelow Jasmine tea is a different tasting tea. If you like jasmine, you may like this tea. I prefer other flavors of tea, and was not a fan of the jasmine. The bags were full of flavor and had a nice aroma. delicate flowery tea with just the right hint of jasmine. This tea works with sweet or savory as it is not sweet in itself. It is actually wonderful if added to jasmine rice to add antioxidants and a nice green tea hint. It is a nice calming tea and very good for nerves and helps with healthy weight, weightloss, cancer prevention, memory and energy. Try this! Unsweetened it was intolerable to drink but with a little bit of honey it mellowed out the flavor. Strange enough it had a earthy kind of flavor. Very strange on the palette but strangely addicting. I had to try it many times to figure out why I liked it. Still don't know, but it's very enjoyable once sweetened. Jasmine is a tea that is a more complex tea. The jasmine flavor blends well with the oolong tea. There is a slight undertone of a smokey breeze. I think this is a wonderful tea, and it is the perfect tea to sit outside with while you enjoy the flowers and fresh air. I just had a cup of this tea this morning and, let me tell you, it's delicious! The smell and taste were pleasant. Would highly recommend this product! I like the foil pouches these come in. The flavor is a nice blend. I really like this tea. I can definitely recommend keeping this on hand.